You decided to make a guild. That’s great! 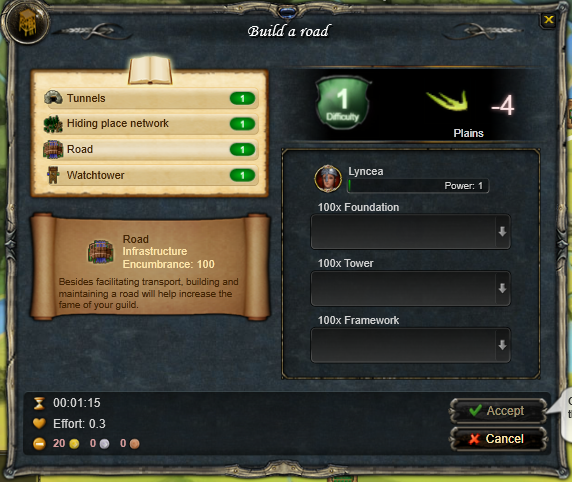 Guilds have access to many aspects of the game that a single player does not. Through guilds you are able to make harnois, an armor that can only be made at a metallurgical factory which is a guild building. You can only mine kryanite clusters in a vertical mine in the Den, another guild building. Want the best bows in the game? Those are made at shipyards, guild building. However, the road won’t be easy. 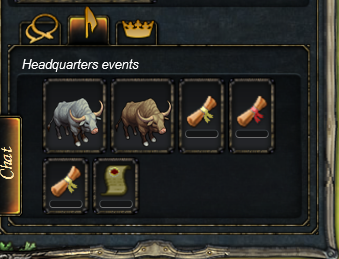 First, you need to acquire a Treaty for a Hall. You can buy it in Hawkoria or Lanfar. In Hawkoria, it is located in the Imperial District, Imperial Court of Record. In Lanfar, it is in Maliken, Falconers’ small fort. It will cost 11 gold 49 silver 99 copper and give you space for 5 members. To gain more member slots, you must progress your guild. When picking a location for the HQ, keep in mind the ease of construction. Many guilds have their HQ in Whitestone Fields for this reason. Most of the building materials can be bought from the NPC in Hawkoria aside from player made only structures like towers and fortifications. 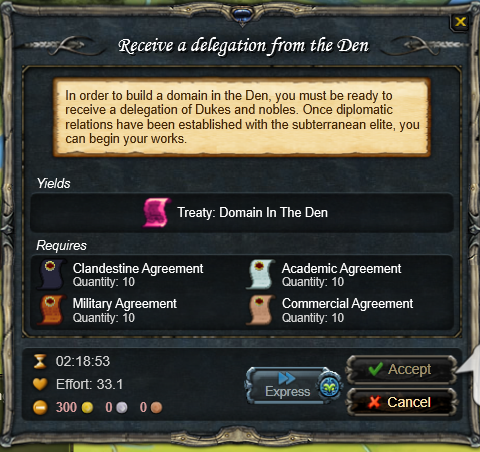 To use the treaty, go to the place you want to put your hall and click manage. It is here you will be able to name your guild. In order to expand your member slots to 10, you need to build a headquarters. 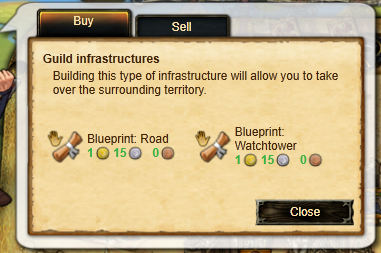 You can buy the blueprint from the Imperial District in Hawkoria. For that, you’re going to need 1000 space at your HQ and some building structures. Once you have your headquarters up and running, you’ll see you have some new options. The transportation skill opens up (see Transportation section). You will be able to draft guild agreements, obtain early guild recipes like monoliths, and recruit basic transportation companions. If you are the guild leader, it is here you will begin rhumbular festivals. 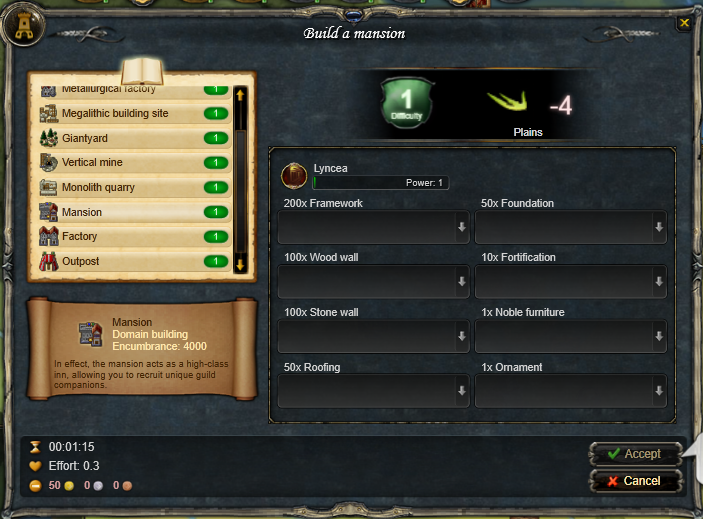 The next stage of member expansion is to build the manor. It will take 5000 space and 1000 gold to put up. This will give you a total of 25 member slots. 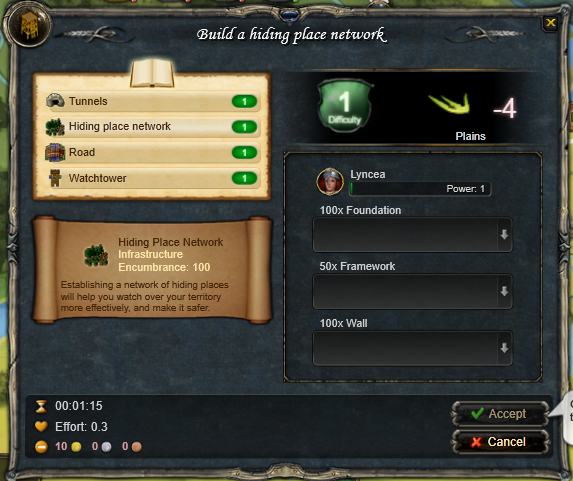 Perhaps this is the easiest way to gain guild agreements and you can start as soon as you have your headquarters built. 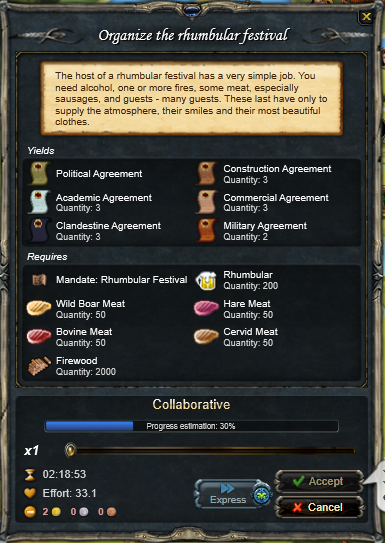 You need 20,000 firewood, 2,000 rhumbular, 500 cervid meat, 500 hare meat, 500 bovine meat, and 500 boar meat. There is a 22 day cool down on it. As soon as you’re able, it’s a good idea to start this. You will need agreements to get recipes and finish delegations, more on those later. Now if you’re looking at the screenshot below and wondering why I said 500 meat instead of 50, each go is only 10%. One of the biggest hurdles in a guild is getting materials from here to there. Certain guild specific items have encumbrance. Items with encumbrance take the transportation skill to move. Your level dictates how much you can move. 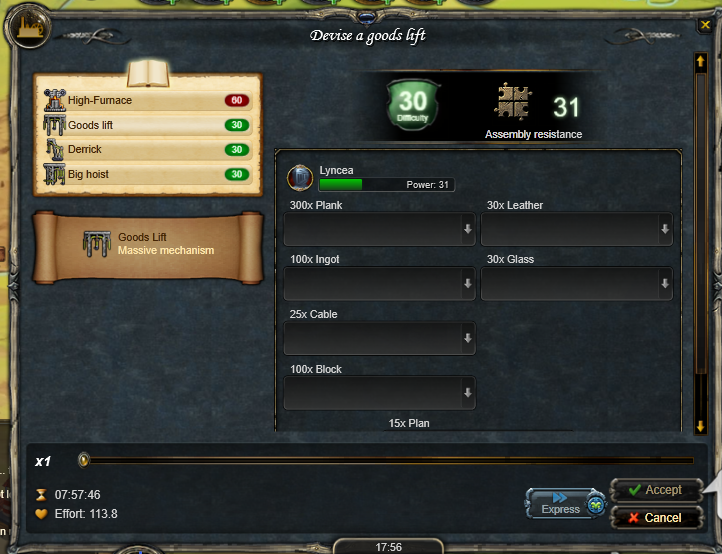 If you have level 15, then you can move one 15 encumbrance item or say three 5 encumbrance items. 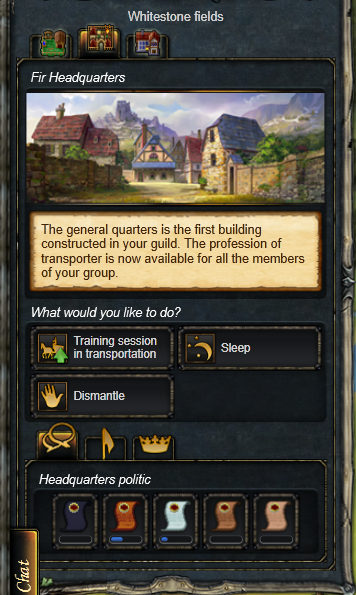 You can further train transportation up to 19 times after unlocking the skill at your guild HQ. Like any skill, the same 40/30/20/10 formula applies. You can draft ox or aurochs as transportation companions at your guild HQ. 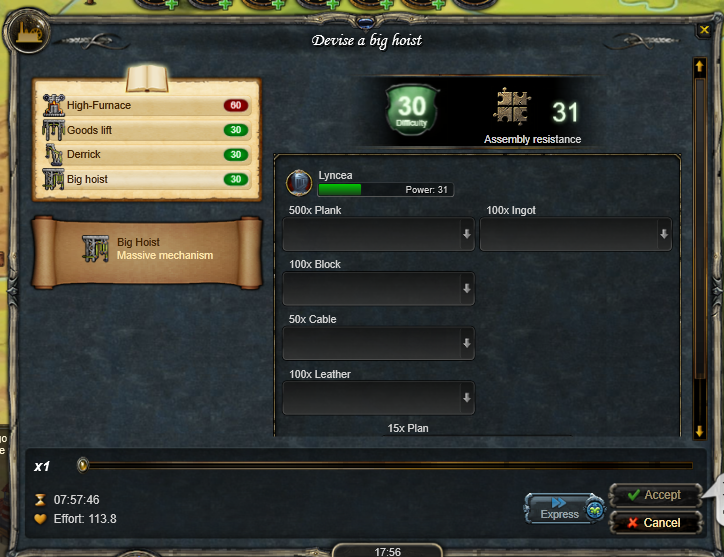 Some higher level companions like the Chimera or Hipporiel, legendary tier 4 companions, have the transportation skill. 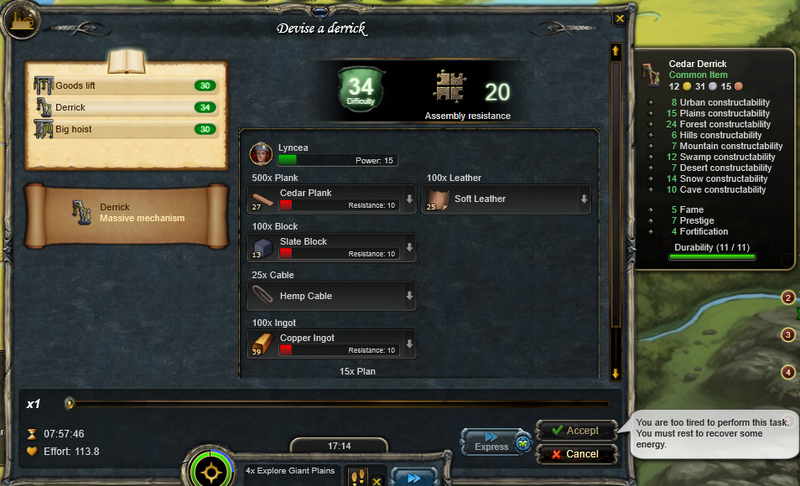 Your wood trade people can make vehicles which go into the tool slot. The drawbacks with vehicles are that once you transport with them, you’ll need to transport them to the starting point to use them again and they are 1 encumbrance. 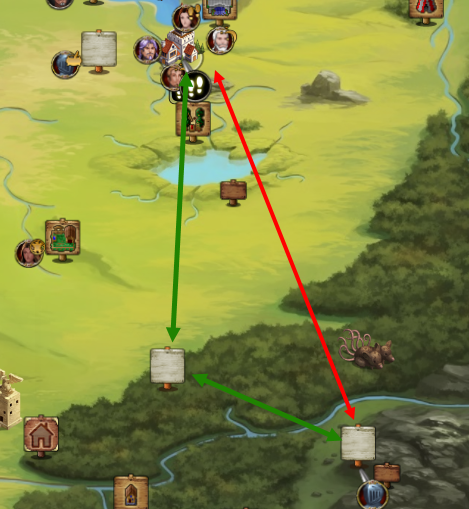 Lastly, you can build roads which would give you a transportation location bonus. A 4 carat amber jewelry will give you +4 transportation. Transportation takes time, lots of it. Using a horn can decrease the amount of time. The skill is limited to guild locations. For instance you can transport from HQ to domain, domain to domain, or domain to HQ. Encumbered items will not be able to move outside these guild locations. You can not transport to non-adjacent domains. For example, in the screen shot below you’ll see two paths. The red one is not able to happen. The green one is good to go. In this instance, Highaerie Hills is not adjacent to Whitestone Fields. In order to transport from Highaerie Hills to the HQ in Whitestone Fields you must first go through the domain in Shortpoint Forest. When putting up a domain, it is important to keep transportation times in mind. 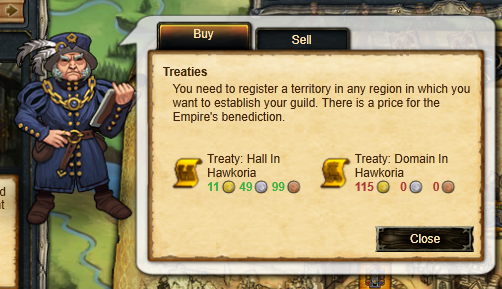 A domain for Hawkoria may be purchased in the Imperial District for 115 gold. 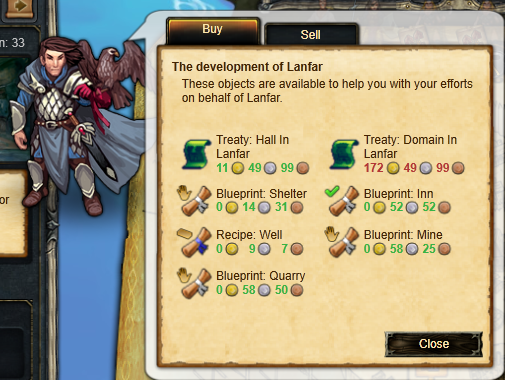 A domain for Lanfar may be purchased at the Falconer’s fort in Maliken for 179 gold 49 silver 99 copper. To set up a domain, go to the desired location and click manage. A Norstrian domain is only available from the Norstrian fish net festival. Domains can hold a wide variety of buildings. 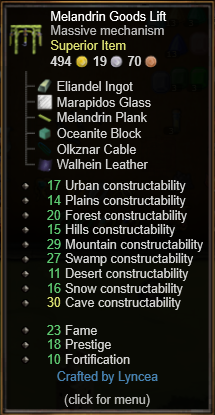 Under the domain tab in the domain, you can build giant yards, monolith quarries, vertical mines, factories, and outposts to start with. When you complete delegations, you will gain the blueprints for the shipyard, metallurgical factory, and megalithic site. 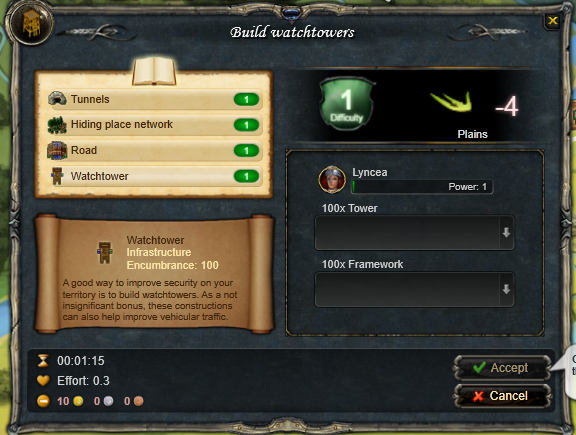 Under the infrastructure tab, you can build tunnels, a hiding place network, roads, and watchtowers. Like in a personal building, the average of each structure used in the guild building must beat the terrain you are building on. For instance, if you are building in Shortblades (20 mountain) you need at least 18.5 mountain average on your structures. The .5 will round up to 19. You get a hero stat of 1. Giant yards allow you to fell giant trees that can be squared into beams. 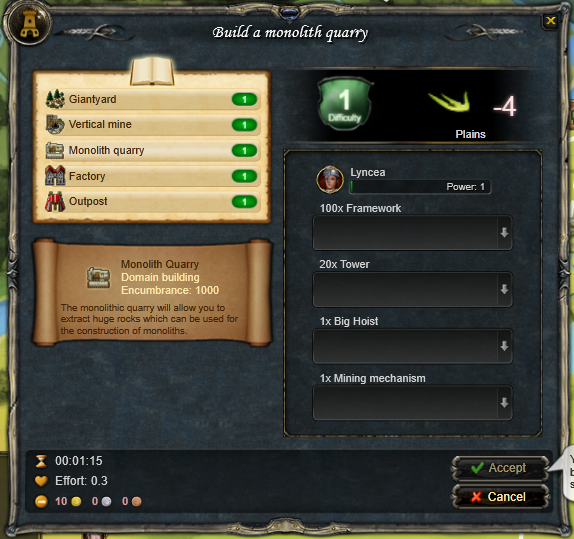 Monolith quarries allow you to extract boulders that can be cut into monoliths. A vertical mine in the Den will allow you to mine kryanite clusters. A vertical mine with rails for stones at Three Brothers will allow you to extract charbalitic clusters which can be fractionated for stardust gems and high quality fuel. A vertical mine with rails for ore at a location where ore is present will make a mine that can be used by any guild member. An outpost simply allows your members to sleep at a domain. Factories are very versatile. They can be any skill depending on what machine you place in it. There are select craftings that must be done in a factory. Vehicles, squaring of beams, fractionating charbalitic clusters, and cutting monoliths must be done at factories. Mega machines, which are used in building factories, can be made an either an engineering factory or a laboratory at a personal concession. 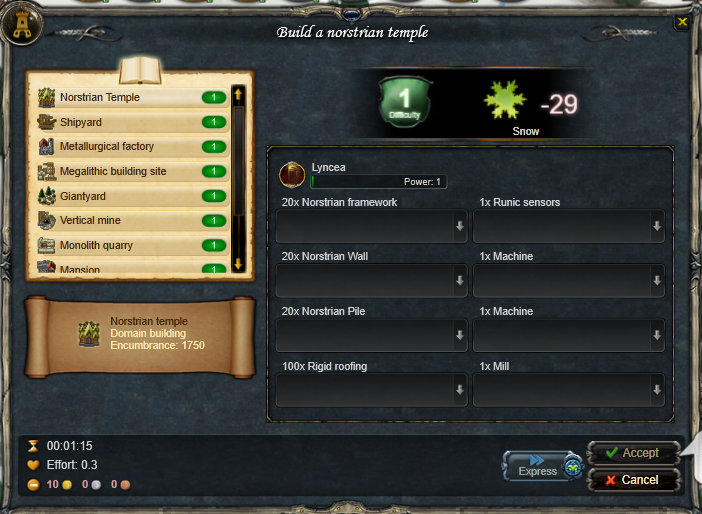 Harnois armor and smelting kryanite are limited to the metallurgical factory. 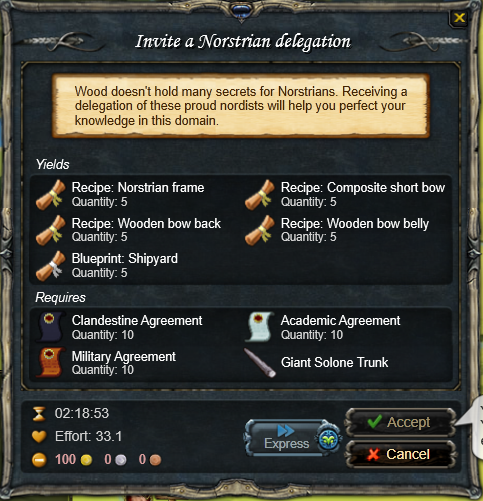 Making Nostrian frames and advanced bows (composite) can only be crafted at a shipyard. Megalithic structures, wall and foundation, are made at the megalithic site. 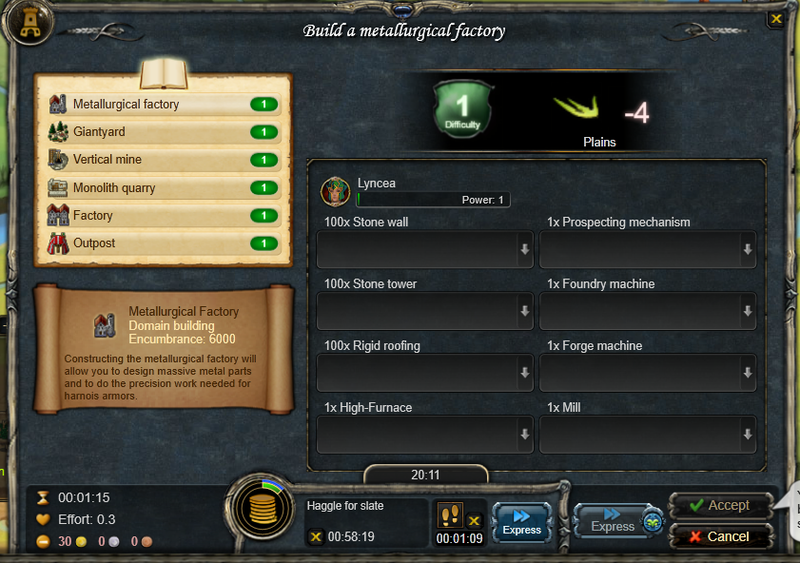 The high furnace needed for the metallurgical factory can only be engineered at a guild factory as it uses monoliths and those do not travel outside of guild locations. The specialty buildings, shipyard, megalithic site, and metallurgical factory, are special in the sense that the machine qualities will be boosted. For example, a 45 quality woodworking machine will become 50 in a shipyard. This is a link to an Excel spreadsheet that contains suggested materials/structures to use for each domain. The original spreadsheet was created by a French player, Cresius. What follows are screenshots of each building. The blueprints you can buy in Hawkoria are below. In order to acquire the blueprints and higher end recipes, you need to do delegations. These are available at your Manor below at manor events. Each delegation requires a certain amount of gold, select agreements, and a resource pertaining to that skill. 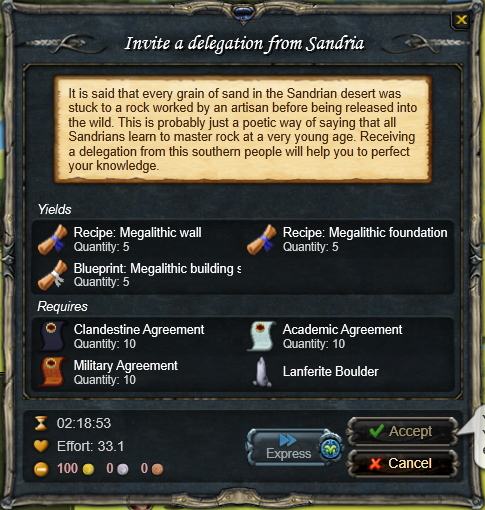 To complete a delegation, you will need the resource, such as a lanferite boulder, at your HQ. It does not count if it is at another domain. 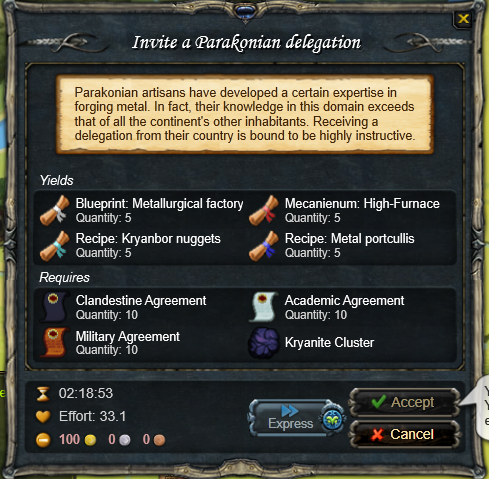 When you do a delegation, you withdraw the agreements needed and the resource like the kryanite cluster into your inventory. Obtaining the treaty for a domain in the Den is the first step to the metallurgical factory. Below are screenshots of each delegation. 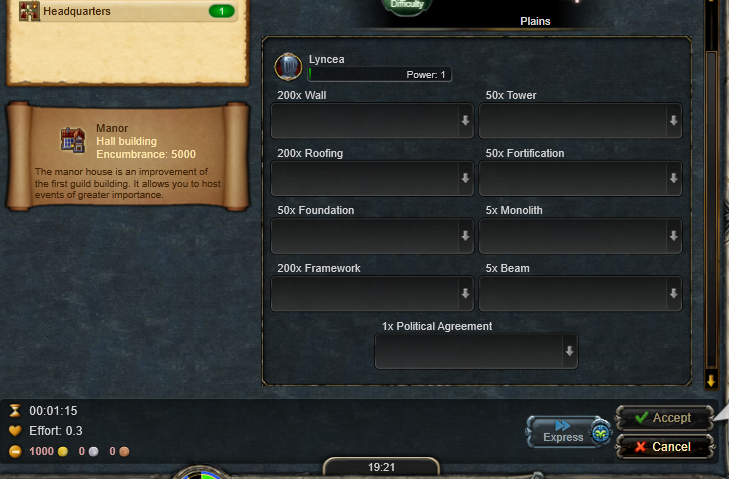 As you have no doubt noticed, guild progression requires a lot of agreements. There are two ways to obtain these agreements. First, there is the rhumbular festival, which I have already covered. Second, you can draft them at your guild HQ. Drafting them is a time consuming process it requires both trade agreements and spying favors. Drafting agreements this way will require many cut gems. Here’s a list of where all of the guild resources are located. Below is a partial list of items with encumbrance. *Note: Processing a charbalitic clusters gives you stardust gems and thundercoal among other lesser fuels. 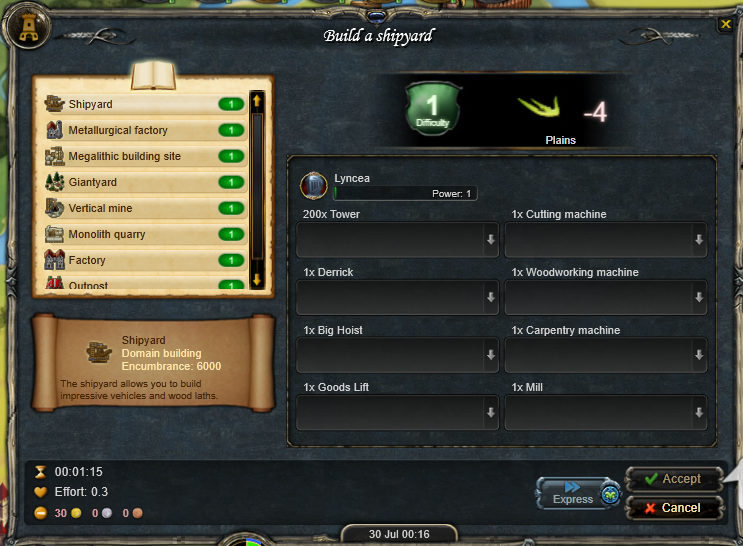 Many guild buildings require mega machines. This is probably one of the first hurdles a guild must conquer before progressing. 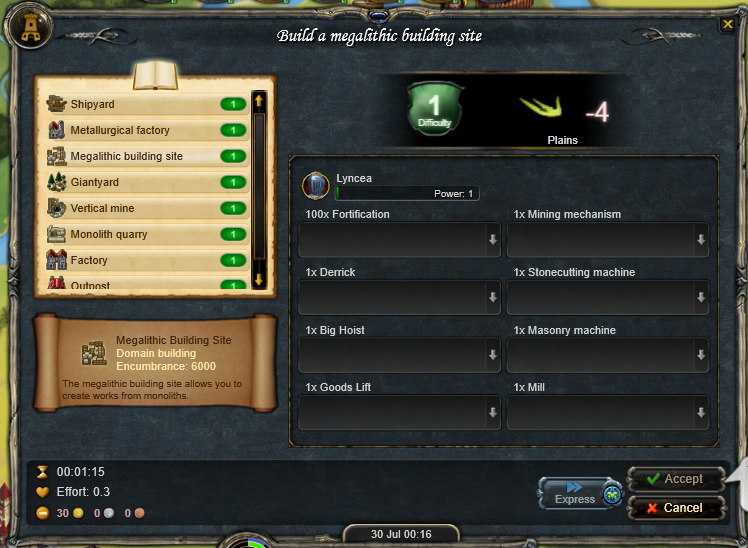 An engineer can make a mega machine in either a guild factory or a laboratory at a personal concession. 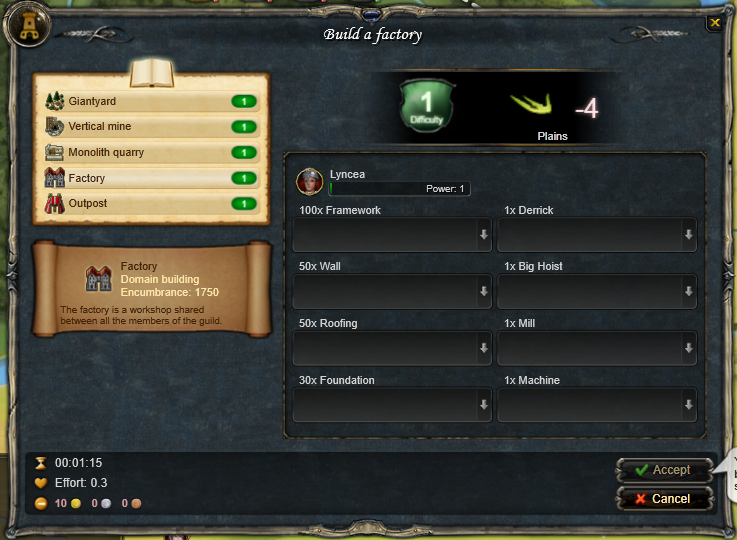 However, since guild factories require mega machines it is somewhat of a catch 22. You can pay an outside engineer to make your mega machines, put up an engineering factory, and have your own engineer make them from then on. 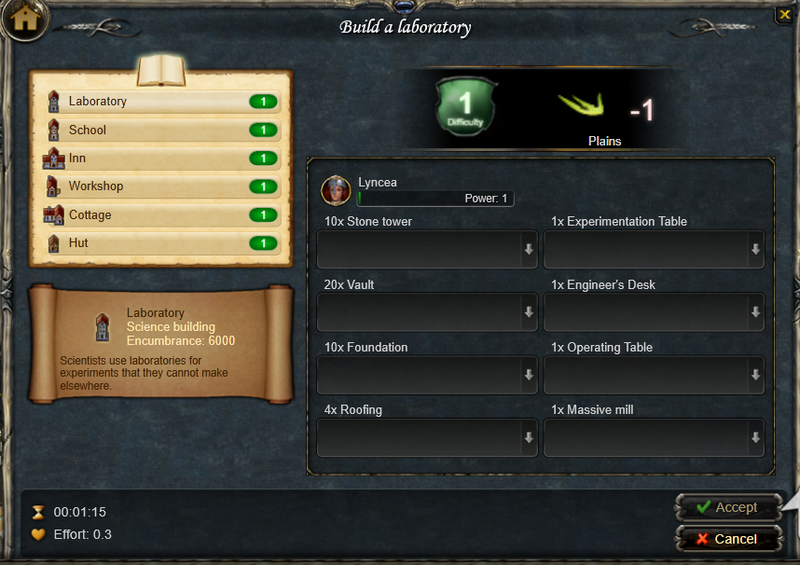 Alternatively, your guild's engineer can acquire the blueprint for the laboratory. To start the quest, you need to be somewhat skilled at alchemy. Ackalabum Kuri in Berius Delta will direct you to Propellio's House. It is there you start the Enigma of Time quest. To complete this quest, you will need science gold wings. Upon successful completion, you will receive the blueprint for a laboratory. The recipes for mega machines can be bought in Hawkoria or acquired through guild training. The exception is the high furnace available only from the Parakonian Delegation. This is the goods lift, combined with marapis towers and vaults, that allows you to build a vertical mine in the Den. As of the October 15, 2014 update, there's a new stage in guild member expansion. 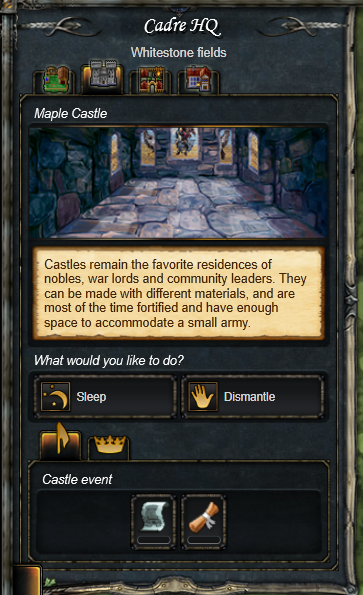 The castle will increase your member slots by the amount of accommodation that it is. 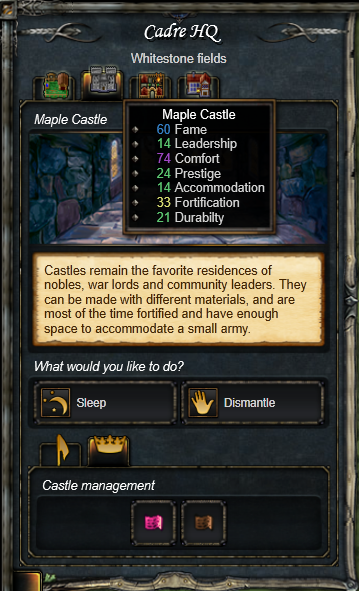 If your castle ends up being 16 accommodation, you will gain 16 member slots. You acquire the blueprint via the Imperial Banquet as seen below. Keep in mind the amounts shown are 10% of the planning. 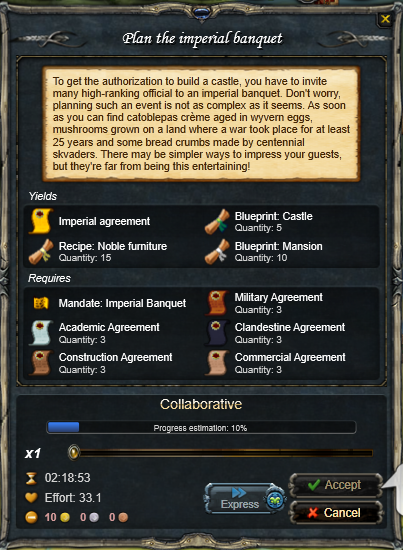 You need the imperial agreement to build your castle. There is no way to skip this step. 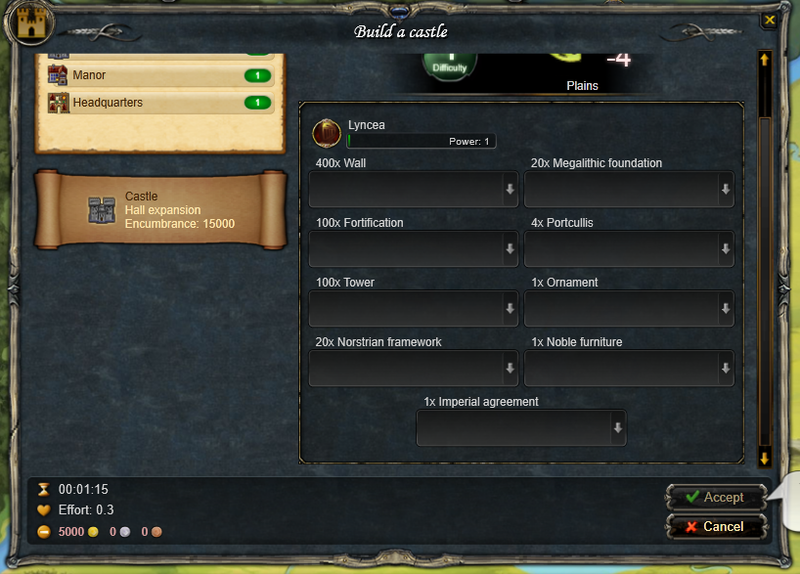 The castle itself costs 5000 gold to build. The blueprint can be found in the blue print section of the guide. View from inside the Castle The blue is the fish festival on the left. On the right is the 100 Runes Nights. 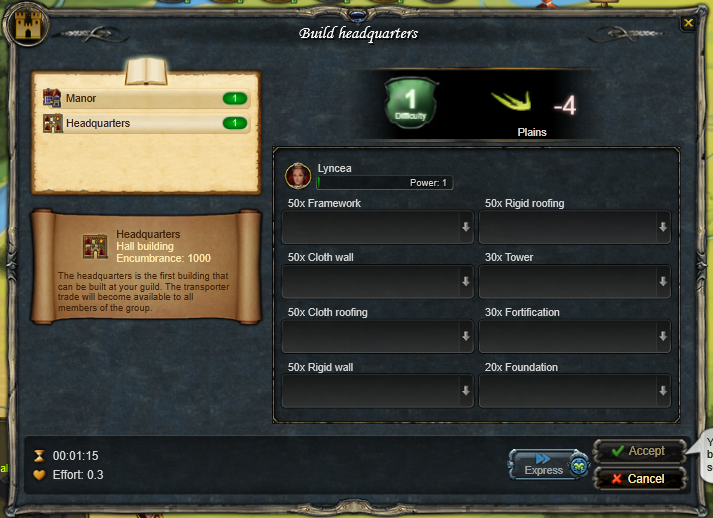 This is the guild leader's tab in the castle and it is where you get the mandates for the festivals. Pink is rune night festival. Brown is the fish festival. 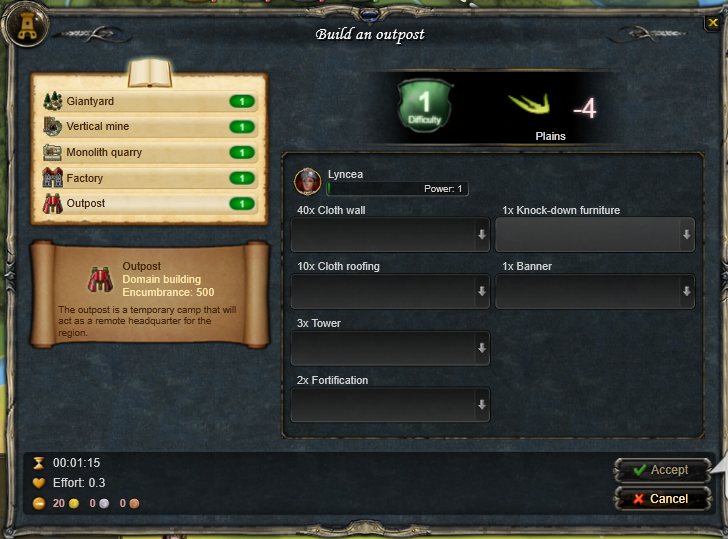 This is a fortified inn for guilds and allows you to reach maximum authority. 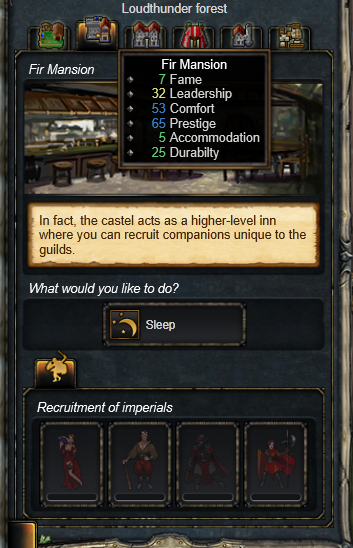 You require 50 comfort and 50 prestige in order to recruit all of the imperial companions available here. The stats of imperial companions are available in the game guide. Nuertesilicio noble furniture with waxed cotton bedding hypothetically can reach 50 comfort. I can not confirm this as we used mohair bedding. 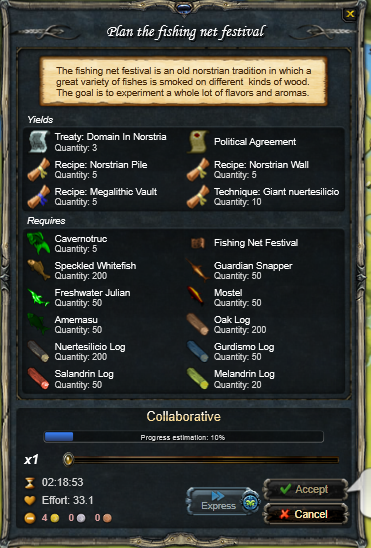 In order to acquire a Norstrian Domain and other recipes, you need to do the fish net festival. 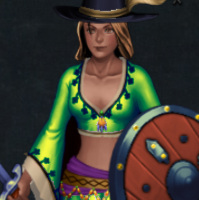 This festival is available at your guild castle. Again, keep in mind that what is listed is 10% of the festival. 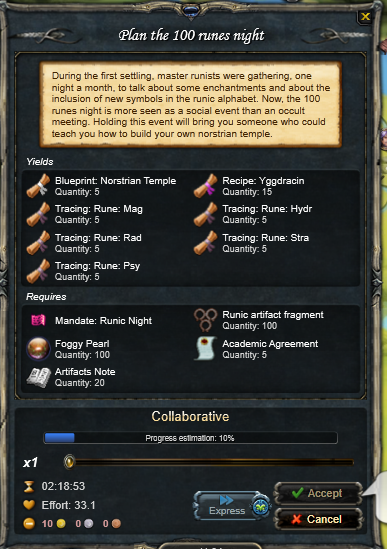 In order to acquire the blueprints for the Norstrian temple along with rune tracings and the yggdracine recipe, you need to do the 100 Rune Nights. Once again, that is 10% of what is needed for one runic meeting. The Red Moon festival gives you the blueprint for the stadium. 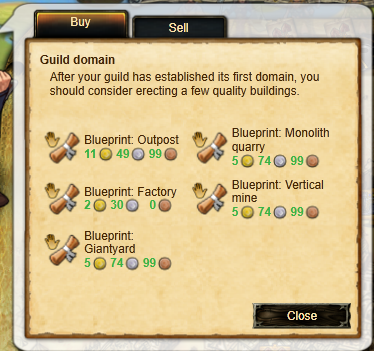 This is a guild building that can only be built in Lanfar. It requires a mixture of plants and substances. The stadium itself gives you three NPCs to summon to fight. They are 50 combat stats +/- 3. The swordsman is slash. The briscard is piercing. The boldarms is blunt. They have a protection buff that is 50% reduced received damage and a reverse vigor that is 60% reduced inflicted damage. There's an hour cool down period. The mandates for the Red Moon festival can be found in the guild leader tab of the Guild Headquarters. The view of a stadium from the domain. The items required for the Behemoth Festival are listed below. Currently, it is assumed that the combatants will be around 60 stats +/- 3. The blueprints show that 3000 space will be needed for the Lithostadium. 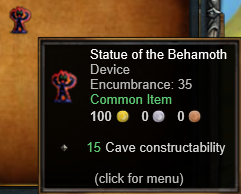 The Behemoth device itself is 35 encumbrance and must be transported from your guild HQ to your guild's Den domain in order to build. Below are the item requirements for the Arenothon and the yield. Each action is 10% so you need 100 of each substance to complete the festival. 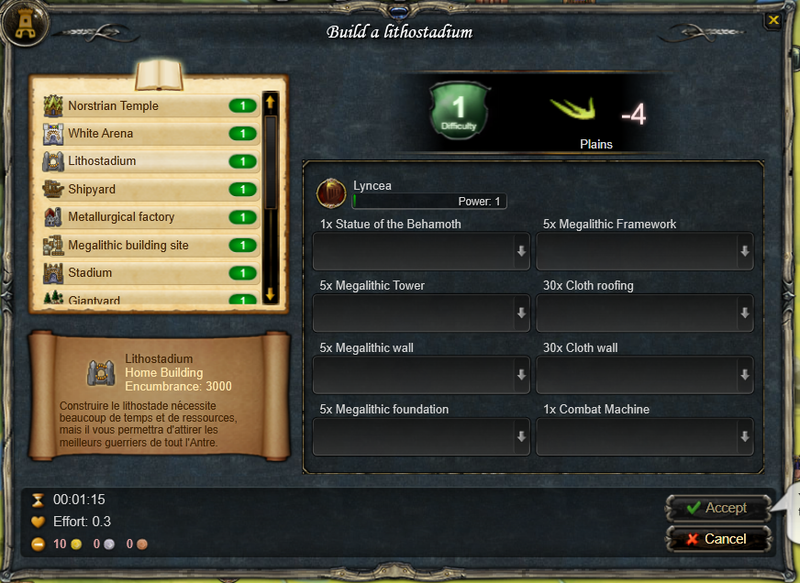 The mandates are located in the guild leader area of the Castle. 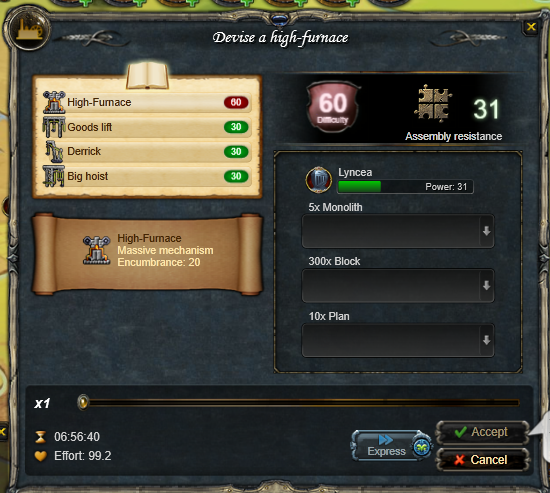 It is currently assumed that the combatants would be 70 stats +/- 3.
do prestige and comfort matter in the manor? 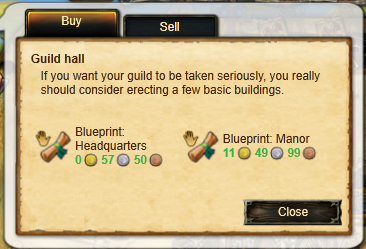 i know for the mansion you want it high to get all companions.. but our guild was built with a low prestige manor(7) and were wondering if that matters..if we tear it down will it kick all our members? should we rebuild it.. or can we just leave it and build a good level mansion when we get that far.. manor is built in hawkoria. Our Manor has 7 prestige as well.